… and even though it´s in Valencian, the Google translator should render it understandable. Recent victories include a 10-6 win over Parcent, turning the game around from 0-5, and a whole string of victories in that morning´s Youth Tournament against Campello, in which Sella won 6 out of the 8 games. 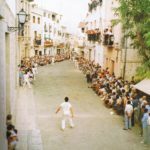 More or less from March through to November the main Square in Sella is often taken over at the weekend by fiercely cotested games of our national sport – Pilota Valenciana.It´s an ancient street game at which Sella, a very small village, excels at all levels. The action is a bit like tennis combined with squash and fives…. There´s an explanation below and a link to a rather learned history of the game. A Llargues: The version ofStreet Pilota Valenciana in which the ball is served at the opposing team either on the volley or on the first bounce, scoring 15 when the ball crosses the line marking the limit of play. A Palma: The version with identical rules to the “llargues” game but making the serve always from below. 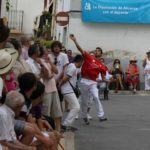 In the “ Palma” game, the player serves facing the opposition and hits the ball with the hand completely open, having made a semi-circular motion with his arm. 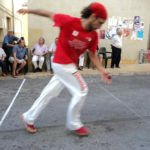 A Perxa: The version of the street game in which the service must be taken from above a mark (usually a string) on the wall, before starting the serve: as from that point it is played the same as in the two previous games. *In these versions the ball used is a Pilota de badana, a ball made from sheepskin, which has always been used in the street games because it´s cheaper than a leather ball ( used in the Trinquet versions) The object of these games is always to win “rattles”, lines, which you do by winning the first or second fifteen after you serve one or two successful lines. You play up to 10 games and the score is like in tennis; fifteen, thirty, forty, game. The teams in the Club de Pilota de Sella play in the Palma and Llargues Leagues in the Plaça Major de Sella from the beginning of March until the month of July. Also, from August to November we play in the Perxa League. As well as this, in the course of the year, there are many games in the Fiestas or other competitions in which our players participate. Of especial importance is the Sella Fiesta Game, the first Tuesday in October in which the best players in the Land of Valencia take part and you could say that this is probably the most important game of the year. …and to end up, here´s some history, the backstory behind Valencia´s national Sport. Pilota is a sport which has been played since time immemorial by peoples as diverse as the Mayas, the Egyptians and the Japanese. Here in the country of Valencia, it began, as did so many other important parts of our culture, with the Greco-Roman tradition. Spread by Roman soldiers, the game was played in France, Belgium, Italy and in the Iberian peninsular throughout the Middle Ages with different versions equivalent to what today is termed “llargues” or “ escala i corda”, according to whether the playing area was open or enclosed. 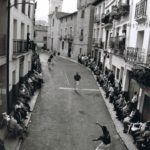 In the Kingdom of Aragón, the game of Pilota was very popular even enjoying Royal patronage or being regularly prohibited in various towns, an indication of how little notice was taken of such prohibitions. In the Land of Valencia the game first appeared with the Knights of the Reconquest, participation and popularity extending from the King himself through the nobility, the priesthood and down to the people and the most humble in every street. The Castillian Kings and nobles, as always following the fashions from across the Pyrenees, also became fans and players of the game which was, through the fifteenth, sixteenth, seventeenth and eighteenth centuries the most played game among both the aristocracy and the people. Limitations, fines and prohibitions together with the appearance of new entertainments caused the game of Pilota to lose importance bit by bit until in the end it disappeared entirely from Cataluña, Castilla, Aragon and the Balearic Islands in the course of then eighteenth and nineteenth centuries.. 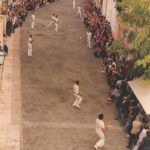 The situation in the Land of Valencia was very different: the prohibitions on playing the game in the street didn´t affect the game played in the Trinquet (a purpose-built hall for Pilota) which remained a vigorous sport across the centuries and was practiced by the flower of Valencian nobility- It managed to keep strong right up to the modern-day, Trinquet version and street version, side by side.